• Your state representative may look a little groggy this morning. After 18 hours and 350+ amendments, the Texas House tentatively passed a $210 billion budget at 6a.m. this morning. Once the Senate approves a budget of its own, a conference committee composed of members from both chambers will negotiate a compromise. • The race to replace former State Representative, now Senator José Menéndez in House District 124 continues. A run-off will be held between Democrats Ina Minjarez (won 42% of the vote), a former Bexar County prosecutor, and Delicia Herrera (won 28% of the vote), a former member of the San Antonio City Council. The winner of this run-off will take the seat formerly held by now Senator Menéndez. The run-off election date has yet to be announced by Governor Abbott. • After an exhaustive search, Gregory Fenves is the sole finalist for the presidency of The University of Texas at Austin. Fenves has served as UT Austin’s provost and executive vice president since 2013. Current UT president Bill Powers will step down in June after serving a nine-year tenure. • The Texas House on Wednesday tentatively approved a ban on texting while driving. The proposed bill would make it a misdemeanor statewide to use a portable wireless device for reading, writing or sending a text while driving. More stringent hands-free regulations already in place will not be affected by the bill. Now the measure will be debated in the Texas Senate. For foodies with a sense of adventure look no further than Odd Duck. Now one of Austin’s favorite upscale eateries, Odd Duck began as a humble food trailer, serving street cuisine with ingredients from local Austin farms. 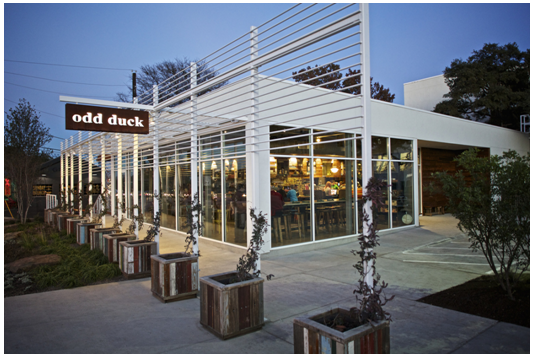 Odd Duck now operates as a full restaurant on the exact lot where the original trailer once stood. The commitment to craftsmanship is evident in a menu filled with fresh Gulf seafood, local produce, and legendary bread baked in-house.